After decades as a counter culture icon, Bob Dylan shocked everyone in 1979 when he released an album with overt christian lyrics. For three albums and three years, Dylan concerts were like evangelistic rallies, and his albums full of songs of faith, and a little self doubt. Everyone had an opinion, mostly not complimentary. Then in 1983, the album Infidels was released, to confound everyone. It contains three of the best songs Dylan has ever recorded, and some dark and enigmatic religion. 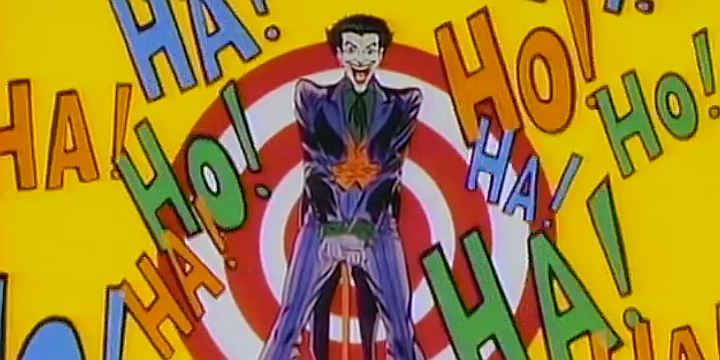 The lyrics of Jokerman, like many Dylan songs, contain many religious references, and the accompanying video kept the theme going. But what was Dylan saying? But if the Jokerman is God, it isn’t always a flattering portrait. The Jokerman God isn’t quite the God of “gentle Jesus, meek and mild”! Finally there were those who pointed out that most Dylan songs had him in there somewhere, and this was no different. Perhaps Dylan saw himself as the Jokerman? Many thoughtful christians have been disappointed with God at times. Medieval mystics wrote about “the dark night of the soul”. Modern day christians experience doubt, and sometimes wonder why God allows so much evil and suffering to go unchecked. Atheists often go further and say that the idea of God, especially as expressed in world religions, is abhorrent. It seems that Dylan can’t live at either of the extremes of joyful faith or extreme Dawkins-like contempt. Jokerman seems to me to show ambivalence, a little of both extremes, with neither winning over the other. Yes, God is glorious, above all the turmoil of this world ( the rifleman’s stalking the sick and the lame …. Nightsticks and water cannons, tear gas, padlocks, Molotov cocktails and rocks behind every curtain ), but that sometimes makes him look either evil or not caring ( Oh, Jokerman, you don’t show any response ). God’s lack of response seems to be the key, emphasised by this phrase coming at the end of the song. This reaction should be no surprise to Christians, or Jews – the Psalms are full of similar impatient disappointment and anguished pleading for God to intervene and stop the evil. God is love, but sometimes that is a very tough love. This song doesn’t seem at first to be the lyrical tour de force that Jokerman is, but it is a beautiful song with some telling images. It is a sort of apocalyptic dream sequence where Dylan wanders restlessly at night and ruminates on life and the future. But this time, it seems Dylan isn’t so much angry at God the Jokerman, as bitterly resigned to God’s lack of care for him: I’ve made shoes for everyone, even you, while I still go barefoot . This song has a very different feel; perhaps this why Dylan ended up leaving it off the final album. It begins with the thought that this land is condemned , and then Dylan explains why, by describing brief scenes of the horrors of slavery in Dixie. It is easy to agree with Dylan. The ways of God are not always easy to understand, even for a believer. But this believer finds Dawkins’ reaction quite impossible, for several reasons. Is Dawkins’ version of God truly evil? Many atheists agree. Our beliefs about right and wrong are subjective, a matter of personal or social opinion. We can disagree with each other, but we can have no objective basis to argue that another “should” change. If that is the case, then how can Dawkins and others “know” that the world is evil and that if God existed, he would be evil too. The word “evil” expresses something about how they feel, but nothing objective. However much it might look like God doesn’t care, he really does – enough to enter human history as a servant and to die at the hands of powerful men to redeem people. The God portrayed the Old Testament, especially the earlier sections, is an incomplete picture. More than half a century ago, CS Lewis pointed out that the earlier beliefs of the Hebrews had to be purged and enlightened …. At first hardly anything comes through but mere power. Then (v. important) the truth that He is One and there is no other God. Then justice, then mercy, love, wisdom. The God Dawkins and most atheists revile is a primitive view of God, not yet refined by revelation, especially the coming of Jesus. The evil in the world may give us reason to doubt God, but so much else in the world gives me reason to believe in God and trust him (see Why believe?). So I can understand Dylan’s ambivalence, but I think it is more logical to say we don’t understand God than to say he is a Jokerman. God is a great big alien being? Christians sometimes give the impression of having God in a box. They understand God, they know exactly what he is doing, and why. Too often he turns out to be just like them. Jokerman and I and I remind us that God is very different to us, not at all tame. He appears to have been willing to create a world that is often beautiful, but can be scary at times. Let’s not kid ourselves, he may indeed by loving, but he’s one tough dude. As Bob found out, he doesn’t always do what we want. Live version of I and I (not all that good, but the best I can find) and the lyrics. Blind Willie McTell (sound only). Graphic: Taken from the YouTube Video of Jokerman.